Pictured here are a few of our family’s favorite books related to the Reformation. 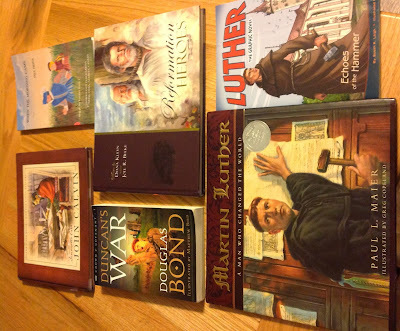 As we approach Reformation Day, I thought it might be useful to recommend some books that will help you remember and celebrate this important time with your children. A couple of years ago I gathered into one post links to some of the best books we had read up to that time on the Reformation. That post contains links to more complete discussions of the books with further links to where the books can be purchased. When the Morning Came (in the photo above but not in the previous post just mentioned) is a great story set in the Netherlands during the Reformation. This is a part of the Reformation which is typically not as well known among us. This book is a long standing family favorite for us and there are three later books which continue the series. Then, I have included in the photo, Duncan’s War, a story of the Scottish Covenanters from the 16th century. This is a century later and a second wave of the Reformation. This book by Douglas Bond and the two books which followed to complete the trilogy are among our all-time favorites. I hope these books might be a blessing to your family as they have been to ours. We are grateful to have the Bible in our own language. We are grateful to have the clear gospel of salvation by grace alone through faith alone in Christ alone proclaimed around us. We are grateful to God for renewing his church in the Reformation.